[Maurice] recently built a clock that draws the time (Google Doc) on a white board. We’ve seen plenty of clock hacks in the past, and even a very similar one. It’s always fun to see the different creative solutions people can come up with to solve the same problem. This device runs on a PIC16F1454 microcontroller. The code for the project is available on GitHub. The micro is also connected to a 433MHz receiver. This allows a PC to keep track of the time, instead of having to include a real-time clock in the circuit. The USB connector is only used for power. All of the mounting pieces were designed in OpenSCAD and printed on a 3D printer. Two servos control the drawing arms. A third servo can raise and lower the marker to the whiteboard. This also has the added benefit of being able to place the marker tip inside of an eraser head. That way the same two servos can also erase the writing. The communication protocol for this systems is interesting. The transmitter shows up on [Maurice’s] PC as a modem. All he needs to do to update the time is “echo 12:00 > /dev/whiteboard”. In this case, the command is run by a cron job every 5 minutes. This makes it easy to tweak the rate at which the time updates on the whiteboard. All communication is done one-way. The drawing circuit will verify the checksum each time it receives a message. If the check fails, the circuit simply waits for another message. The computer transmits the message multiple times, just in case there is a problem during transmission. [Michael Peshkin] teaches mechanical engineering at Northwestern University. He likes to use diagrams to illustrate his point, but he also likes to face his students when doing so. His solution was to develop this clear whiteboard which ends up unlocking a lot more than just some hand-drawn schematics. It’s a bit hard to see what he’s written on the board in the image above but squint and see if you can figure out what’s wrong with this style of teaching? Everything he’s writing is backwards. That’s not actually a problem in this case as [Michael] uses flip teaching. He records and posts all of his lectures online. Classroom time is then used for question and answer on the lecture subjects. In order to get the text to read the correct way he just bounces the camera off of a mirror. The board itself is a huge sheet of tempered glass attached to the metal frame using bolts through holes in the pane. This leave the edges free. He added extruded rail to the top and bottom to embed strips of LEDs. They light the inside of the glass, and excite the fluorescent dry erase marker ink making it much more visible. 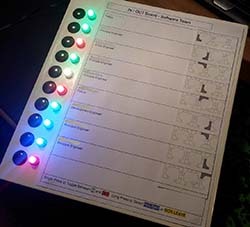 [Michael] didn’t stop with the board, he also rigged up a lighting system that gives him a lot of options, and uses a monitor for dealing with digital overlays. He can put up a diagram on the computer, watching the monitor to see where his marker is making annotations. All this happens in real-time which means no post production! See a demo of these features after the break. This could all be done without the glass at all, but that would make it quite a bit more difficult for the person doing the writing. This one is so simple, and works so well, we’d call it a hoax if April 1st hadn’t already passed us by. But we’re confident that what [William Myers] and [Guo Jie Chin] came up with exists, and we want one of our own. The project is a method of drawing in 3 dimensions using ultrasonic sensors. They call it 3D Paint, and that’s fitting since the software interface is much like the original MS Paint. It can show you the movements of the stylus in three axes, but it can also assemble an anaglyph — the kind of 3D that uses those red and blue filter glasses — so that the artists can see the 3D rendering as it is being drawn. 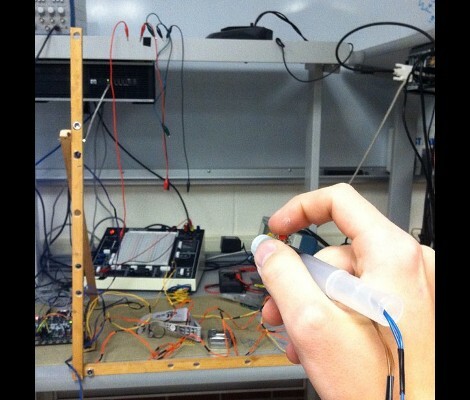 The hardware depends on a trio of sensors and a stylus that are all controlled by an ATmega644. That’s it for hardware (to be fair, there are a few trivial amplifier circuits too), making this an incredibly affordable setup. The real work, and the reason the input is so smooth and accurate, comes in the MATLAB code which does the trilateration. If you like to get elbow deep in the math the article linked above has plenty to interest you. If you’re more of a visual learner just skip down after the break for the demo video.